A Dhaka court on Tuesday sent Barrister Mainul Hosein to jail in a case filed for defaming journalist Masuda Bhatti on a TV talk show. Additional Chief Metropolitan Magistrate Mohamamd Kaisarul Islam of Dhaka passed the order after hearing the case. Advocate Khandaker Mahbub Hossain stood for Mainul while public prosecutor of Dhaka Metropoltian Session Judge Court Abdullah Abu represented the state. Detective Branch of police produced him before the court after arresting the former caretaker government adviser from in front of Jatiya Samajtantrik Dal (JSD) President ASM Abdur Rob’s Uttara residence on Monday night. Earlier in the day, Judge Arifa Yasmin Mukta of Additional Chief Judicial Magistrate Court in Ragpur issued a warrant for Mainul’s arrest after a local human rights activist, Mili Maya, filed a defamation case with it. Six cases have so far been filed against Mainul Hosein across the country. Of those, Masuda Bhatti herself filed a defamation suit in Dhaka on October 21. On the same day, three more defamation cases were filed in Jamalpur, Comilla and Kurigram districts. Besides, two more cases — one in Bhola and another in Rangpur — were filed on Monday. 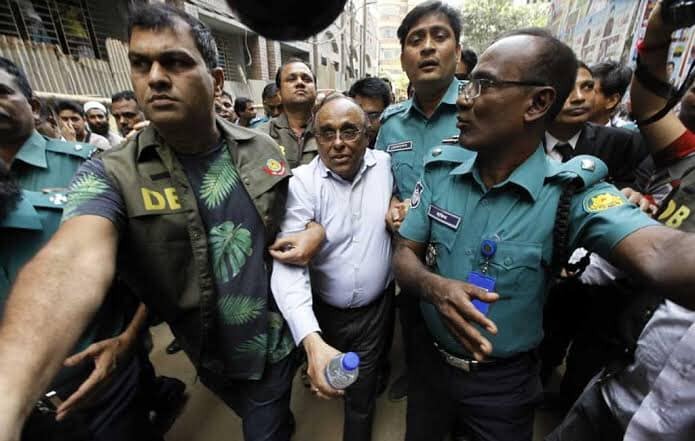 The High Court on Sunday granted bail for five months to Barrister Mainul Hosein in two defamation cases after hearing separate petitions filed by him. According to the case statement filed by Masuda Bhatti, Mainul who was connected to a talk show programme, ‘Ekattorer Journal’, through a videoconference aired on a private TV channel, Ekattor TV, hosted by Mithila Farzana, made an ‘offensive comments’ against her on October 16. Mainul Hosein was playing active role in the newly formed Jatiya Oikyafront, led by Dr Kamal Hossain. He took part in various meetings of the Oikyafront leaders. Mainul was an adviser to the army-backed caretaker government when Awami President Sheikh Hasina and BNP chairperson Khaleda were arrested.